← Youngest Pro Shuffleboard Player In Florida. Great Story!!!!!!! Sent along by Gary Pipher. Earl Demonstrates His Writing Skills!!! Check It Out!! Lots of great stories but I’m only going to tell you about the Champions: I’m not going to tell you that Gus wrecked his car or that Stan lost, so did Earl, Mike, Dean, Ron, Pam, Terri & Debbie, as well as a host of other really great players. The men’s field was down to 31 teams but the women were up more than the men were down. A great field and tournament director George Adyns kept us moving. The Women’s Division was won by Pauline Murphy and Nancy Myklejord of the Lakeland Club and they in and of themselves are Cinderella stories. Pauline, as a 1st year Pro lead the Central District in points and won their “Masters” as well as qualifying for and playing in the State “Masters” and now she has repeated as National Champion. Nancy also put together a great season qualifying for and playing in the Central District “Masters” as well as her 1st State “Masters” and now is a National Champion. It wasn’t easy but if it was it wouldn’t be a great story. They fought their way through every match but the one that really mattered, the Championship match was a dousey. First of all, it went three games. Barbra King and Carol Adams of the Leesburg, Hawthorne Club had Nancy and Pauline down by 41 points, 20 of which were in the hole, before they came storming back to win. Barbra and Carol won game two to set up a donnybrook in the 3rd game. The score went back and forth as well as up and back down. But in the end Pauline and Nancy found themselves at 75 first and are National Champions. The men’s division was even a bigger story. 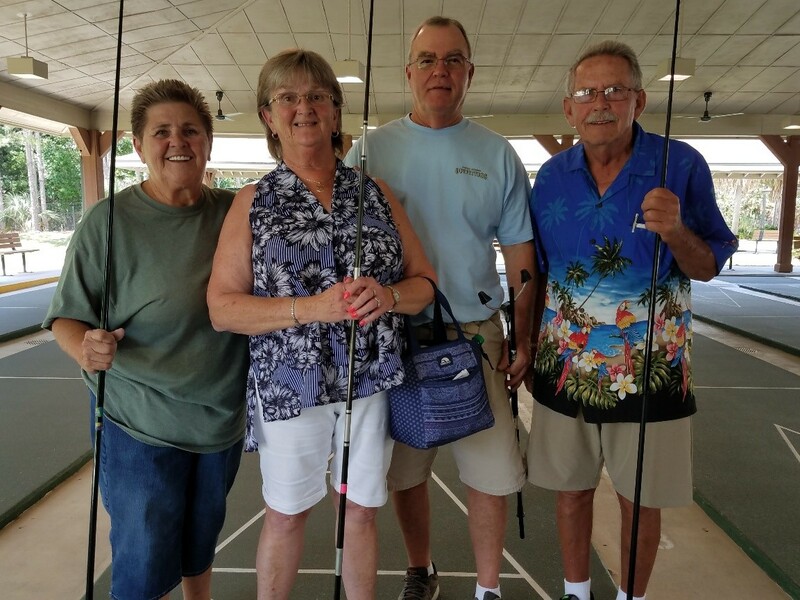 The story actually starts a few years ago when Buddy Allen of the Zephyrhills Club had the nerve to leave the winning score on the board and shoot a match winning 10 to win the Eastern National Singles Championship in Hendersonville. It’s important to know that Buddy is a golfer and therefore is an unpredictable Shuffleboard player; or maybe golf has nothing to do with it! He teamed win Lyle Walker of the Leesburg, Hawthorne Club, and the action started in the 1/4s. The Zephyrhills Club’s powerhouse team of defending Champion, John Houghtaling and Central District “Masters” Champion, Gary McGaffey were leading in the 3rd game 67-49 and Gary, playing the foot, had a good 8 partially hidden; the winning score. Buddy had to find a way to get the 8 out with his hammer. He elected to shoot at the edge of the block he could see. He shot hard and nicked the block sending it cross court and wouldn’t you know it stopped in the kitchen. Lyle scored an 8 with his hammer tying the score. Gary got an 8 hidden, again, putting his team back in the 60’s. Buddy tried to get it from the inside but stayed on the center line. Gary elected to knock that block off the board with his last shot but missed his shot knocking it into his good 8 and leaving Buddy’s block on the 8. Buddy decided to try and win the match right there and don’t you know he did it! As calm and cool as a cucumber he shot a dead center10 to win the match. The finals were played against Erik Hahmann, an outstanding young player of the St Pete Club and Steve Ramondi, a State “Masters” player of the Clearwater Club. The match went two games but both had exciting finishes. The 1st game ended when Lyle, trailing 72-68, put in a high 8 leaving Steve the option of scoring to win or losing if he didn’t score. Steve decided to remove the 8 and let Erik win it from the foot but Steve miss hit the block leaving it on the court and Erik didn’t get a chance to win the game. In game two Steve and Erik lead again 71-69 with Erik having the hammer at the foot and a chance to win the game. Buddy, however, put in a high 10 with his last shot leaving Erik with the decision of removing the 10 or shooting an 8 to tie, sending the game into overtime. Now, this young man can make any shot anytime but he elected to send the 10 for the kitchen but missed. Lyle scored from the head to earn his 1st National Championship.